Hypercholesterolemia, also called high cholesterol, is the presence of high levels of cholesterol in the blood. It is a form of hyperlipidemia, high blood lipids, and hyperlipoproteinemia (elevated levels of lipoproteins in the blood). Xanthelasma palpebrarum, yellowish patches consisting of cholesterol deposits above the eyelids. These are more common in people with familial hypercholesterolemia. Elevated levels of non-HDL cholesterol and LDL in the blood may be a consequence of diet, obesity, inherited (genetic) diseases (such as LDL receptor mutations in familial hypercholesterolemia), or the presence of other diseases such as type 2 diabetes and an underactive thyroid. Cholesterol is one of three major classes of lipids which all animal cells use to construct their membranes and is thus manufactured by all animal cells. Plant cells do not manufacture cholesterol. It is also the precursor of the steroid hormones and bile acids. Since cholesterol is insoluble in water, it is transported in the blood plasma within protein particles (lipoproteins). Lipoproteins are classified by their density: very low density lipoprotein (VLDL), intermediate density lipoprotein (IDL), low density lipoprotein (LDL) and high density lipoprotein (HDL). All the lipoproteins carry cholesterol, but elevated levels of the lipoproteins other than HDL (termed non-HDL cholesterol), particularly LDL-cholesterol, are associated with an increased risk of atherosclerosis and coronary heart disease. In contrast, higher levels of HDL cholesterol are protective. Avoiding trans fats and replacing saturated fats in adult diets with polyunsaturated fats are recommended dietary measures to reduce total blood cholesterol and LDL in adults. In people with very high cholesterol (e.g., familial hypercholesterolemia), diet is often not sufficient to achieve the desired lowering of LDL, and lipid-lowering medications are usually required. If necessary, other treatments such as LDL apheresis or even surgery (for particularly severe subtypes of familial hypercholesterolemia) are performed. About 34 million adults in the United States have high blood cholesterol. Although hypercholesterolemia itself is asymptomatic, longstanding elevation of serum cholesterol can lead to atherosclerosis (hardening of arteries). Over a period of decades, elevated serum cholesterol contributes to formation of atheromatous plaques in the arteries. This can lead to progressive narrowing of the involved arteries. Alternatively smaller plaques may rupture and cause a clot to form and obstruct blood flow. A sudden blockage of a coronary artery may result in a heart attack. A blockage of an artery supplying the brain can cause a stroke. If the development of the stenosis or occlusion is gradual, blood supply to the tissues and organs slowly diminishes until organ function becomes impaired. At this point tissue ischemia (restriction in blood supply) may manifest as specific symptoms. For example, temporary ischemia of the brain (commonly referred to as a transient ischemic attack) may manifest as temporary loss of vision, dizziness and impairment of balance, difficulty speaking, weakness or numbness or tingling, usually on one side of the body. Insufficient blood supply to the heart may cause chest pain, and ischemia of the eye may manifest as transient visual loss in one eye. Insufficient blood supply to the legs may manifest as calf pain when walking, while in the intestines it may present as abdominal pain after eating a meal. Some types of hypercholesterolemia lead to specific physical findings. 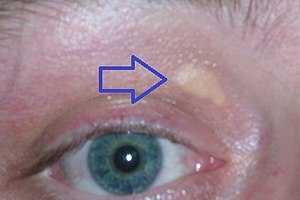 For example, familial hypercholesterolemia (Type IIa hyperlipoproteinemia) may be associated with xanthelasma palpebrarum (yellowish patches underneath the skin around the eyelids), arcus senilis (white or gray discoloration of the peripheral cornea), and xanthomata (deposition of yellowish cholesterol-rich material) of the tendons, especially of the fingers. Type III hyperlipidemia may be associated with xanthomata of the palms, knees and elbows. Hypercholesterolemia is typically due to a combination of environmental and genetic factors. Environmental factors include weight, diet, and stress. A number of other conditions can also increase cholesterol levels including diabetes mellitus type 2, obesity, alcohol use, monoclonal gammopathy, dialysis, nephrotic syndrome, hypothyroidism, Cushing’s syndrome, anorexia nervosa, medications (e.g., thiazide diuretics, ciclosporin, glucocorticoids, beta blockers, retinoic acid, antipsychotics). Genetic abnormalities are in some cases completely responsible for hypercholesterolemia, such as in familial hypercholesterolemia, where one or more genetic mutations in the autosomal dominant APOB gene exist, the autosomal recessive LDLRAP1 gene, autosomal dominant familial hypercholesterolemia (HCHOLA3) variant of the PCSK9 gene, or the LDL receptor gene. Familial hypercholesterolemia affects about one in five hundred people. Diet has an effect on blood cholesterol, but the size of this effect varies between individuals. Moreover, when dietary cholesterol intake goes down, production (principally by the liver) typically increases, so that blood cholesterol changes can be modest or even elevated. This compensatory response may explain hypercholesterolemia in anorexia nervosa. A 2016 review found tentative evidence that dietary cholesterol is associated with higher blood cholesterol. Trans fats have been shown to reduce levels of HDL while increasing levels of LDL. LDL and total cholesterol also increases by very high fructose intake. Glucocorticoids increase cholesterol LDL production by increasing production and activity of HMG-CoA reductase. These include the physiologic stress hormone cortisol and commonly used medicines for asthma, rheumatoid arthritis, or connective tissue disorders. Other steroid hormones and drugs are also implicated. In contrast, the thyroid hormone decreases cholesterol production. Hence, hypothyroidism (lack of thyroid hormone) causes hypercholesterolemia. Hypercholesterolemia may be a side effect of a number of medications, including blood pressure medication, antipsychotics, anticonvulsants, immunosuppressives, human immunodeficiency virus therapy, and interferons. Cholesterol is measured in milligrams per deciliter (mg/dL) of blood in the United States and some other countries. In the United Kingdom, most European countries and Canada, millimoles per liter of blood (mmol/Ll) is the measure. For healthy adults, the UK National Health Service recommends upper limits of total cholesterol of 5 mmol/L, and low-density lipoprotein cholesterol (LDL) of 3 mmol/L. For people at high risk of cardiovascular disease, the recommended limit for total cholesterol is 4 mmol/L, and 2 mmol/L for LDL. In the United States, the National Heart, Lung, and Blood Institute within the National Institutes of Health classifies total cholesterol of less than 200 mg/dL as “desirable,” 200 to 239 mg/dL as “borderline high,” and 240 mg/dL or more as “high”. No absolute cutoff between normal and abnormal cholesterol levels exists, and interpretation of values must be made in relation to other health conditions and risk factors. total cholesterol - HDL - (0.2 x fasting triglycerides). However, this equation is not valid on nonfasting blood samples or if fasting triglycerides are elevated >4.5 mmol/L (> ∼400 mg/dL). Recent guidelines have, therefore, advocated the use of direct methods for measurement of LDL wherever possible. It may be useful to measure all lipoprotein subfractions ( VLDL, IDL, LDL, and HDL) when assessing hypercholesterolemia and measurement of apolipoproteins and lipoprotein (a) can also be of value. Genetic screening is now advised if a form of familial hypercholesterolemia is suspected. Classically, hypercholesterolemia was categorized by lipoprotein electrophoresis and the Fredrickson classification. Newer methods, such as "lipoprotein subclass analysis", have offered significant improvements in understanding the connection with atherosclerosis progression and clinical consequences. If the hypercholesterolemia is hereditary (familial hypercholesterolemia), more often a family history of premature, earlier onset atherosclerosis is found. Two bags of fresh frozen plasma: The bag on the left was obtained from a donor with hyperlipidemia, while the other bag was obtained from a donor with normal serum lipid levels. The U.S. Preventive Services Task Force in 2008 strongly recommends routine screening for men 35 years and older and women 45 years and older for lipid disorders and the treatment of abnormal lipids in people who are at increased risk of coronary heart disease. They also recommend routinely screening men aged 20 to 35 years and women aged 20 to 45 years if they have other risk factors for coronary heart disease. In 2016 they concluded that testing the general population under the age of 40 without symptoms is of unclear benefit. In Canada, screening is recommended for men 40 and older and women 50 and older. In those with normal cholesterol levels, screening is recommended once every five years. Once people are on a statin further testing provides little benefit except to possibly determine compliance with treatment. For those at high risk, a combination of lifestyle modification and statins has been shown to decrease mortality. Lifestyle changes recommended for those with high cholesterol include: smoking cessation, limiting alcohol consumption, increasing physical activity, and maintaining a healthy weight. Overweight or obese individuals can lower blood cholesterol by losing weight – on average a kilogram of weight loss can reduce LDL cholesterol by 0.8 mg/dl. Eating a diet with a high proportion of vegetables, fruit, dietary fibre, and low in fats results in a modest decrease in total cholesterol. Eating dietary cholesterol causes a small but significant rise in serum cholesterol. Dietary limits for cholesterol were proposed in United States, but not in Canada, United Kingdom, and Australia. Consequently, in 2015 the Dietary Guidelines Advisory Committee in the United States removed its recommendation of limiting cholesterol intake. A 2015 Cochrane review found replacing saturated fat with polyunsaturated fat resulted in a small decrease in cardiovascular disease by decreasing blood cholesterol. Other reviews have not found an effect from saturated fats on cardiovascular disease. Trans fats are recognized as a potential risk factor for cholesterol-related cardiovascular disease, and avoiding them in an adult diet is recommended. The National Lipid Association recommends that people with familial hypercholesterolemia restrict intakes of total fat to 25–35% of energy intake, saturated fat to less than 7% of energy intake, and cholesterol to less than 200 mg per day. Changes in total fat intake in low calorie diets do not appear to affect blood cholesterol. Increasing soluble fiber consumption has been shown to reduce levels of LDL cholesterol, with each additional gram of soluble fiber reducing LDL by an average of 2.2 mg/dL (0.057 mmol/L). Increasing consumption of whole grains also reduces LDL cholesterol, with whole grain oats being particularly effective. Inclusion of 2 g per day of phytosterols and phytostanols and 10 to 20 g per day of soluble fiber decreases dietary cholesterol absorption. A diet high in fructose can raise LDL cholesterol levels in the blood. Statins are the typically used medications, in addition to healthy lifestyle interventions. Statins can reduce total cholesterol by about 50% in the majority of people, and are effective in reducing the risk of cardiovascular disease in both people with and without pre-existing cardiovascular disease. In people without cardiovascular disease, statins have been shown to reduce all-cause mortality, fatal and non-fatal coronary heat disease, and strokes. Greater benefit is observed with the use of high-intensity statin therapy. Statins may improve quality of life when used in people without existing cardiovascular disease (i.e. for primary prevention). Statins decrease cholesterol in children with hypercholesterolemia, but no studies as of 2010 show improved outcomes and diet is the mainstay of therapy in childhood. Other agents that may be used include fibrates, nicotinic acid, and cholestyramine. These, however, are only recommended if statins are not tolerated or in pregnant women. Injectable antibodies against the protein PCSK9 (evolocumab, bococizumab, alirocumab) can reduce LDL cholesterol and have been shown to reduce mortality. According to a survey in 2002, alternative medicine was used in an attempt to treat cholesterol by 1.1% of U.S. adults. Consistent with previous surveys, this one found the majority of individuals (55%) used it in conjunction with conventional medicine. A review of trials of phytosterols and/or phytostanols, average dose 2.15 g/day, reported an average of 9% lowering of LDL-cholesterol. In 2000, the Food and Drug Administration approved the labeling of foods containing specified amounts of phytosterol esters or phytostanol esters as cholesterol-lowering; in 2003, an FDA Interim Health Claim Rule extended that label claim to foods or dietary supplements delivering more than 0.8 g/day of phytosterols or phytostanols. Some researchers, however, are concerned about diet supplementation with plant sterol esters and draw attention to lack of long-term safety data. Rates of high total cholesterol in the United States in 2010 are just over 13%, down from 17% in 2000. Average total cholesterol in the United Kingdom is 5.9 mmol/L, while in rural China and Japan, average total cholesterol is 4 mmol/L. Rates of coronary artery disease are high in Great Britain, but low in rural China and Japan. Various clinical practice guidelines have addressed the treatment of hypercholesterolemia. The National Cholesterol Education Program revised their guidelines; however, their 2004 revisions have been criticized for use of nonrandomized, observational data. In the UK, the National Institute for Health and Clinical Excellence has made recommendations for the treatment of elevated cholesterol levels, published in 2008. The Task Force for the management of dyslipidaemias of the European Society of Cardiology and the European Atherosclerosis Society published guidelines for the management of dyslipidaemias in 2011. Gene therapy is being studied as a potential treatment. Among people whose life expectancy is relatively short, hypercholesterolemia is not a risk factor for death by any cause including coronary heart disease. Among people older than 70, hypercholesterolemia is not a risk factor for being hospitalized with myocardial infarction or angina. There are also increased risks in people older than 85 in the use of statin drugs. Because of this, medications which lower lipid levels should not be routinely used among people with limited life expectancy. Lipid-lowering therapy should be used for secondary prevention of cardiovascular mortality and morbidity for all adults with known coronary artery disease and type 2 diabetes. Statins should be used for primary prevention against macrovascular complications in adults with type 2 diabetes and other cardiovascular risk factors. Once lipid-lowering therapy is initiated, people with type 2 diabetes mellitus should be taking at least moderate doses of a statin. For those people with type 2 diabetes who are taking statins, routine monitoring of liver function tests or muscle enzymes is not recommended except in specific circumstances. ^ a b c d Durrington, P (August 2003). "Dyslipidaemia". The Lancet. 362 (9385): 717–31. doi:10.1016/S0140-6736(03)14234-1. PMID 12957096. ^ Biggerstaff KD, Wooten JS (December 2004). "Understanding lipoproteins as transporters of cholesterol and other lipids". Adv Physiol Educ. 28 (1–4): 105–06. doi:10.1152/advan.00048.2003. PMID 15319192. ^ Carmena R, Duriez P, Fruchart JC (June 2004). "Atherogenic lipoprotein particles in atherosclerosis". Circulation. 109 (23 Suppl 1): III2–7. doi:10.1161/01.CIR.0000131511.50734.44. PMID 15198959. ^ Kontush A, Chapman MJ (March 2006). "Antiatherogenic small, dense HDL – guardian angel of the arterial wall?". Nat Clin Pract Cardiovasc Med. 3 (3): 144–53. doi:10.1038/ncpcardio0500. PMID 16505860. ^ "Healthy diet – Fact sheet N°394". World Health Organization. September 2015. Retrieved July 6, 2016. ^ a b c de Souza, RJ; Mente, A; Maroleanu, A; Cozma, AI; Ha, V; Kishibe, T; Uleryk, E; Budylowski, P; Schünemann, H; Beyene, J; Anand, SS (11 August 2015). "Intake of saturated and trans unsaturated fatty acids and risk of all cause mortality, cardiovascular disease, and type 2 diabetes: systematic review and meta-analysis of observational studies". BMJ (Clinical Research Ed.). 351: h3978. doi:10.1136/bmj.h3978. PMC 4532752. PMID 26268692. ^ a b c d e f Ito MK, McGowan MP, Moriarty PM (June 2011). "Management of familial hypercholesterolemias in adult patients: recommendations from the National Lipid Association Expert Panel on Familial Hypercholesterolemia". J Clin Lipidol. 5 (3 Suppl): S38–45. doi:10.1016/j.jacl.2011.04.001. PMID 21600528. ^ a b "Hypercholesterolemia". Genetics Home Reference. Retrieved 16 May 2016. ^ a b c d e f g h Bhatnagar D, Soran H, Durrington PN (2008). "Hypercholesterolaemia and its management". BMJ. 337: a993. doi:10.1136/bmj.a993. PMID 18719012. ^ Finn AV, Nakano M, Narula J, Kolodgie FD, Virmani R (July 2010). "Concept of vulnerable/unstable plaque". Arterioscler. Thromb. Vasc. Biol. 30 (7): 1282–92. doi:10.1161/ATVBAHA.108.179739. PMID 20554950. ^ Grundy, SM; Balady, GJ; Criqui, MH; Fletcher, G; Greenland, P; Hiratzka, LF; Houston-Miller, N; Kris-Etherton, P; Krumholz, HM; Larosa, J.; Ockene, I. S.; Pearson, T. A.; Reed, J.; Washington, R.; Smith, S. C. (1998). "Primary prevention of coronary heart disease: guidance from Framingham: a statement for healthcare professionals from the AHA Task Force on Risk Reduction. American Heart Association". Circulation. 97 (18): 1876–87. doi:10.1161/01.CIR.97.18.1876. PMID 9603549. ^ Shields, C; Shields, J (2008). Eyelid, conjunctival, and orbital tumors: atlas and textbook. Hagerstown, Maryland: Lippincott Williams & Wilkins. ISBN 978-0-7817-7578-6. ^ Zech LA Jr; Hoeg JM (2008-03-10). "Correlating corneal arcus with atherosclerosis in familial hypercholesterolemia". Lipids Health Dis. 7 (1): 7. doi:10.1186/1476-511X-7-7. PMC 2279133. PMID 18331643. ^ a b James, WD; Berger, TG (2006). Andrews' Diseases of the Skin: Clinical Dermatology. Saunders Elsevier. pp. 530–32. ISBN 978-0-7216-2921-6. ^ Rapini, RP; Bolognia, JL; Jorizzo, JL (2007). Dermatology: 2-Volume Set. St. Louis, Missouri: Mosby. pp. 1415–16. ISBN 978-1-4160-2999-1. ^ Calderon, R.; Schneider, R. H.; Alexander, C. N.; Myers, H. F.; Nidich, S. I.; Haney, C. (1999). "Stress, stress reduction and hypercholesterolemia in African Americans: a review". Ethnicity & Disease. 9: 451–462. ISSN 1049-510X. ^ "Secondary Causes of Hypercholesterolemia". www.utmb.edu. Retrieved 2018-12-15. ^ "Hypercholesterolemia". Genetics Home Reference. U.S. National Institutes of Health. Retrieved 5 December 2013. ^ a b Mannu, GS; Zaman, MJ; Gupta, A; Rehman, HU; Myint, PK (1 February 2013). "Evidence of lifestyle modification in the management of hypercholesterolemia". Current Cardiology Reviews. 9 (1): 2–14. doi:10.2174/157340313805076313. PMC 3584303. PMID 22998604. ^ Howell WH, McNamara DJ, Tosca MA, Smith BT, Gaines JA (June 1997). "Plasma lipid and lipoprotein responses to dietary fat and cholesterol: a meta-analysis". Am. J. Clin. Nutr. 65 (6): 1747–64. doi:10.1093/ajcn/65.6.1747. PMID 9174470. ^ Stryer, Lubert; Berg, Jeremy Mark; Tymoczko, John L. (2007). Biochemistry. San Francisco: W.H. Freeman. ISBN 978-0-7167-8724-2. ^ Nordestgaard, Børge G.; Langsted, Anne; Mora, Samia; Kolovou, Genovefa; Baum, Hannsjörg; Bruckert, Eric; Watts, Gerald F.; Sypniewska, Grazyna; Wiklund, Olov (2016-07-01). "Fasting is not routinely required for determination of a lipid profile: clinical and laboratory implications including flagging at desirable concentration cut-points-a joint consensus statement from the European Atherosclerosis Society and European Federation of Clinical Chemistry and Laboratory Medicine". European Heart Journal. 37 (25): 1944–1958. doi:10.1093/eurheartj/ehw152. ISSN 1522-9645. PMC 4929379. PMID 27122601. ^ Grundy, SM (November 2016). "Does Dietary Cholesterol Matter?". Current Atherosclerosis Reports. 18 (11): 68. doi:10.1007/s11883-016-0615-0. PMID 27739004. ^ Ascherio A, Willett WC (October 1997). "Health effects of trans fatty acids". Am. J. Clin. Nutr. 66 (4 Suppl): 1006S–10S. doi:10.1093/ajcn/66.4.1006S. PMID 9322581. ^ Zhang, Yu Hui; An, Tao; Zhang, Rong Cheng; Zhou, Qiong; Huang, Yan; Zhang, Jian (2013-09-01). "Very high fructose intake increases serum LDL-cholesterol and total cholesterol: a meta-analysis of controlled feeding trials". The Journal of Nutrition. 143 (9): 1391–98. doi:10.3945/jn.113.175323. ISSN 1541-6100. PMID 23825185. ^ a b Mitropoulos, K. A.; Balasubramaniam, S. (1976-10-15). "The role of glucocorticoids in the regulation of the diurnal rhythm of hepatic beta-hydroxy-beta-methylglutaryl-coenzyme A reductase and cholesterol 7 alpha-hydroxylase". The Biochemical Journal. 160 (1): 49–55. doi:10.1042/bj1600049. ISSN 0264-6021. PMC 1164200. PMID 12745. ^ Maduka, Ignatius C; Neboh, Emeka E; Ufelle, Silas A (2017-03-20). "The relationship between serum cortisol, adrenaline, blood glucose and lipid profile of undergraduate students under examination stress". African Health Sciences. 15 (1): 131–36. doi:10.4314/ahs.v15i1.18. ISSN 1680-6905. PMC 4370130. PMID 25834541. ^ a b Herink, Megan; Ito, Matthew K. (2000-01-01). "Medication Induced Changes in Lipid and Lipoproteins". In De Groot, Leslie J.; Chrousos, George; Dungan, Kathleen; Feingold, Kenneth R.; Grossman, Ashley; Hershman, Jerome M.; Koch, Christian; Korbonits, Márta; McLachlan, Robert (eds.). Endotext. South Dartmouth (MA): MDText.com, Inc. PMID 26561699. United States Department of Health and Human Services; National Heart Lung and Blood Institute; National Institutes of Health (June 2005). "NHLBI, High Blood Cholesterol: What You Need to Know". nhlbi.nih.gov. Retrieved 27 March 2013. ^ a b c d e f g h Consumer Reports; Drug Effectiveness Review Project (March 2013). "Evaluating statin drugs to treat High Cholesterol and Heart Disease: Comparing Effectiveness, Safety, and Price" (PDF). Best Buy Drugs. Consumer Reports: 9. Retrieved 27 March 2013. ^ Grundy, SM; Cleeman, JI; Merz, CN; Brewer HB, Jr; Clark, LT; Hunninghake, DB; Pasternak, RC; Smith SC, Jr; Stone, NJ (Jul 13, 2004). "Implications of recent clinical trials for the National Cholesterol Education Program Adult Treatment Panel III guidelines". Circulation. 110 (2): 227–39. doi:10.1161/01.cir.0000133317.49796.0e. PMID 15249516. ^ High Cholesterol – Tests and Diagnosis, Mayo Clinic staff. Retrieved 2013-03-09. ^ Diagnosing High Cholesterol, NHS Choices. Retrieved 2013-03-09. ^ ATP III Guidelines At-A-Glance Quick Desk Reference, National Cholesterol Education Program. Retrieved 2013-03-09. ^ Peters, Sanne A. E.; Singhateh, Yankuba; Mackay, Diana; Huxley, Rachel R.; Woodward, Mark (2016-05-01). "Total cholesterol as a risk factor for coronary heart disease and stroke in women compared with men: A systematic review and meta-analysis". Atherosclerosis. 248: 123–131. doi:10.1016/j.atherosclerosis.2016.03.016. ISSN 1879-1484. PMID 27016614. ^ a b c d e f g h Reiner Z, Catapano AL, De Backer G, et al. (July 2011). "ESC/EAS Guidelines for the management of dyslipidaemias: the Task Force for the management of dyslipidaemias of the European Society of Cardiology (ESC) and the European Atherosclerosis Society (EAS)". Eur. Heart J. 32 (14): 1769–818. doi:10.1093/eurheartj/ehr158. PMID 21712404. ^ U.S. Preventive Services Task Force. "Screening for Lipid Disorders: Recommendations and Rationale". Retrieved 2010-11-04. ^ Chou Roger (9 August 2016). "Screening for Dyslipidemia in Younger Adults: A Systematic Review for the U.S. Preventive Services Task Force". Annals of Internal Medicine. 165 (8): 560–564. doi:10.7326/M16-0946. PMID 27538032. ^ Bibbins-Domingo, Kirsten; Grossman, David C.; Curry, Susan J.; Davidson, Karina W.; Epling, John W.; García, Francisco A. R.; Gillman, Matthew W.; Kemper, Alex R.; Krist, Alex H.; Kurth, Ann E.; Landefeld, C. Seth; Lefevre, Michael; Mangione, Carol M.; Owens, Douglas K.; Phillips, William R.; Phipps, Maureen G.; Pignone, Michael P.; Siu, Albert L. (August 9, 2016). "Screening for Lipid Disorders in Children and Adolescents". JAMA. 316 (6): 625. doi:10.1001/jama.2016.9852. ^ Genest, J; Frohlich, J; Fodor, G; McPherson, R (2003-10-28). "Recommendations for the management of dyslipidemia and the prevention of cardiovascular disease: summary of the 2003 update". Canadian Medical Association Journal. 169 (9): 921–4. PMC 219626. PMID 14581310. ^ National Cholesterol Education Program (NCEP), III) (2002-12-17). "Third Report of the National Cholesterol Education Program (NCEP) Expert Panel on Detection, Evaluation, and Treatment of High Blood Cholesterol in Adults (Adult Treatment Panel III) final report". Circulation. 106 (25): 3143–421. doi:10.1161/circ.106.25.3143. PMID 12485966. ^ Spector, R; Snapinn, SM (2011). "Statins for secondary prevention of cardiovascular disease: the right dose". Pharmacology. 87 (1–2): 63–69. doi:10.1159/000322999. PMID 21228612. ^ Bhattarai, N; Prevost, AT; Wright, AJ; Charlton, J; Rudisill, C; Gulliford, MC (20 December 2013). "Effectiveness of interventions to promote healthy diet in primary care: systematic review and meta-analysis of randomised controlled trials". BMC Public Health. 13: 1203. doi:10.1186/1471-2458-13-1203. PMC 3890643. PMID 24355095. ^ Hartley, L; Igbinedion, E; Holmes, J; Flowers, N; Thorogood, M; Clarke, A; Stranges, S; Hooper, L; Rees, K (4 June 2013). "Increased consumption of fruit and vegetables for the primary prevention of cardiovascular diseases". The Cochrane Database of Systematic Reviews. 6 (6): CD009874. doi:10.1002/14651858.CD009874.pub2. PMC 4176664. PMID 23736950. ^ a b Brownawell, Amy M.; Falk, Michael C. (2010-06-01). "Cholesterol: where science and public health policy intersect". Nutrition Reviews. 68 (6): 355–64. doi:10.1111/j.1753-4887.2010.00294.x. ISSN 1753-4887. PMID 20536780. ^ Berger, Samantha; Raman, Gowri; Vishwanathan, Rohini; Jacques, Paul F.; Johnson, Elizabeth J. (2015-08-01). "Dietary cholesterol and cardiovascular disease: a systematic review and meta-analysis". The American Journal of Clinical Nutrition. 102 (2): 276–94. doi:10.3945/ajcn.114.100305. ISSN 1938-3207. PMID 26109578. ^ The 2015 Dietary Guidelines Advisory Committee (2015). "Scientific Report of the 2015 Dietary Guidelines Advisory Committee" (PDF). health.gov. p. 17. Retrieved 16 May 2016. The 2015 DGAC will not bring forward this recommendation 644 because available evidence shows no appreciable relationship between consumption of dietary cholesterol and serum cholesterol, consistent with the conclusions of the AHA/ACC report. ^ Hooper, L; Martin, N; Abdelhamid, A; Davey Smith, G (10 June 2015). "Reduction in saturated fat intake for cardiovascular disease". The Cochrane Database of Systematic Reviews. 6 (6): CD011737. doi:10.1002/14651858.CD011737. PMID 26068959. ^ Chowdhury, R; Warnakula, S; Kunutsor, S; Crowe, F; Ward, HA; Johnson, L; Franco, OH; Butterworth, AS; Forouhi, NG; Thompson, SG; Khaw, KT; Mozaffarian, D; Danesh, J; Di Angelantonio, E (18 March 2014). "Association of dietary, circulating, and supplement fatty acids with coronary risk: a systematic review and meta-analysis". Annals of Internal Medicine. 160 (6): 398–406. doi:10.7326/M13-1788. PMID 24723079. ^ Schwingshackl, L; Hoffmann, G (December 2013). "Comparison of effects of long-term low-fat vs high-fat diets on blood lipid levels in overweight or obese patients: a systematic review and meta-analysis". Journal of the Academy of Nutrition and Dietetics. 113 (12): 1640–61. doi:10.1016/j.jand.2013.07.010. PMID 24139973. Including only hypocaloric diets, the effects of low-fat vs high-fat diets on total cholesterol and LDL cholesterol levels were abolished. ^ Brown, Lisa; Rosner, Bernard; Willett, Walter W.; Sacks, Frank M. (1999-01-01). "Cholesterol-lowering effects of dietary fiber: a meta-analysis". The American Journal of Clinical Nutrition. 69 (1): 30–42. doi:10.1093/ajcn/69.1.30. ISSN 0002-9165. PMID 9925120. ^ Hollænder, Pernille LB; Ross, Alastair B.; Kristensen, Mette (2015-09-01). "Whole-grain and blood lipid changes in apparently healthy adults: a systematic review and meta-analysis of randomized controlled studies". The American Journal of Clinical Nutrition. 102 (3): 556–72. doi:10.3945/ajcn.115.109165. ISSN 0002-9165. PMID 26269373. ^ Schaefer, EJ; Gleason, JA; Dansinger, ML (June 2009). "Dietary fructose and glucose differentially affect lipid and glucose homeostasis". The Journal of Nutrition. 139 (6): 1257S–62S. doi:10.3945/jn.108.098186. PMC 2682989. PMID 19403705. ^ Grundy, Scott M.; Stone, Neil J.; Bailey, Alison L.; Beam, Craig; Birtcher, Kim K.; Blumenthal, Roger S.; Braun, Lynne T.; de Ferranti, Sarah; Faiella-Tommasino, Joseph (2018-11-10). "2018 AHA/ACC/AACVPR/AAPA/ABC/ACPM/ADA/AGS/APhA/ASPC/NLA/PCNA Guideline on the Management of Blood Cholesterol: A Report of the American College of Cardiology/American Heart Association Task Force on Clinical Practice Guidelines". Circulation: CIR0000000000000625. doi:10.1161/CIR.0000000000000625. ISSN 0009-7322. PMID 30586774. ^ Windecker, Stephan; Mach, François; Räber, Lorenz; Mavridis, Dimitris; Piccolo, Raffaele; Siontis, George C. M.; Koskinas, Konstantinos C. (2018-04-07). "Effect of statins and non-statin LDL-lowering medications on cardiovascular outcomes in secondary prevention: a meta-analysis of randomized trials". European Heart Journal. 39 (14): 1172–1180. doi:10.1093/eurheartj/ehx566. ISSN 0195-668X. PMID 29069377. ^ Tonelli, M; Lloyd, A; Clement, F; Conly, J; Husereau, D; Hemmelgarn, B; Klarenbach, S; McAlister, FA; Wiebe, N; Manns, B (2011-11-08). "Efficacy of statins for primary prevention in people at low cardiovascular risk: a meta-analysis". CMAJ : Canadian Medical Association Journal. 183 (16): E1189–E1202. doi:10.1503/cmaj.101280. PMC 3216447. PMID 21989464. ^ Mills, EJ; Wu, P; Chong, G; Ghement, I; Singh, S; Akl, EA; Eyawo, O; Guyatt, G; Berwanger, O; Briel, M (February 2011). "Efficacy and safety of statin treatment for cardiovascular disease: a network meta-analysis of 170,255 patients from 76 randomized trials". QJM : Monthly Journal of the Association of Physicians. 104 (2): 109–24. doi:10.1093/qjmed/hcq165. PMID 20934984. ^ Cholesterol Treatment Trialists' (CTT) Collaborators (2012). "The effects of lowering LDL cholesterol with statin therapy in people at low risk of vascular disease: meta-analysis of individual data from 27 randomised trials". Lancet. 380 (9841): 581–90. doi:10.1016/S0140-6736(12)60367-5. PMC 3437972. PMID 22607822. ^ Jeanne, Thomas L.; Daeges, Monica; Blazina, Ian; Dana, Tracy; Chou, Roger (2016-11-15). "Statins for Prevention of Cardiovascular Disease in Adults: Evidence Report and Systematic Review for the US Preventive Services Task Force". JAMA. 316 (19): 2008–2024. doi:10.1001/jama.2015.15629. ISSN 0098-7484. PMID 27838722. ^ a b Taylor, Fiona; Huffman, Mark D; Macedo, Ana Filipa; Moore, Theresa HM; Burke, Margaret; Davey Smith, George; Ward, Kirsten; Ebrahim, Shah (2013-01-31). "Statins for the primary prevention of cardiovascular disease". Cochrane Database of Systematic Reviews (1): CD004816. doi:10.1002/14651858.cd004816.pub5. ISSN 1465-1858. PMC 4164175. PMID 23440795. ^ Expert Opin Pharmacother. 2015 Feb;16(3):347–56. doi: 10.1517/14656566.2014.986094. Epub 2014 Dec 5. Ongoing challenges for pharmacotherapy for dyslipidemia. Pisaniello AD, Scherer DJ, Kataoka Y, Nicholls SJ. ^ Lebenthal Y, Horvath A, Dziechciarz P, Szajewska H, Shamir R (2010). "Are treatment targets for hypercholesterolemia evidence based? Systematic review and meta-analysis of randomised controlled trials". Arch Dis Child. 95 (9): 673–80. doi:10.1136/adc.2008.157024. PMID 20515970. ^ a b c National Institute for Health and Clinical Excellence. Clinical guideline 67: Lipid modification. London, 2008. ^ Navarese EP; Kolodziejczak M; Schulze V; Gurbel PA; Tantry U; Lin Y; Brockmeyer M; Kandzari DE; Kubica JM; D'Agostino RB Sr; Kubica J; Volpe M; Agewall S; Kereiakes DJ; Kelm M. (7 July 2015). "Effects of Proprotein Convertase Subtilisin/Kexin Type 9 Antibodies in Adults With Hypercholesterolemia: A Systematic Review and Meta-analysis". Ann Intern Med. 163 (1): 40–51. doi:10.7326/M14-2957. PMID 25915661. ^ Barnes PM, Powell-Griner E, McFann K, Nahin RL (May 27, 2004). "Complementary and Alternative Medicine Use Among Adults: United States, 2002" (PDF). Advance Data from Vital and Health Statistics. http://nccih.nih.gov/news/2004/052704.htm (343): 6–9. Retrieved 2010-11-04. ^ Demonty I, Ras RT, van der Knaap HC, Duchateau GS, Meijer L, Zock PL, Geleijnse JM, Trautwein EA (February 2009). "Continuous dose-response relationship of the LDL-cholesterol-lowering effect of phytosterol intake". J Nutr. 139 (2): 271–84. doi:10.3945/jn.108.095125. PMID 19091798. ^ Weingärtner O.; Bohm, M.; Laufs, U.; et al. (2009). "Controversial role of plant sterol esters in the management of hypercholesterolaemia". European Heart Journal. 30 (4): 404–09. doi:10.1093/eurheartj/ehn580. PMC 2642922. PMID 19158117. ^ Carrol, Margaret (April 2012). "Total and High-density Lipoprotein Cholesterol in Adults: National Health and Nutrition Examination Survey, 2009–2010" (PDF). CDC. ^ Grundy SM, Cleeman JI, Merz CN, Brewer HB, Clark LT, Hunninghake DB, Pasternak RC, Smith SC, Stone NJ (2004). "Implications of recent clinical trials for the National Cholesterol Education Program Adult Treatment Panel III Guidelines". J Am Coll Cardiol. 44 (3): 720–32. doi:10.1016/j.jacc.2004.07.001. PMID 15358046. ^ Hayward, RA; Hofer, TP; Vijan, S (2006). "Narrative review: lack of evidence for recommended low-density lipoprotein treatment targets: a solvable problem". Ann Intern Med. 145 (7): 520–30. doi:10.7326/0003-4819-145-7-200610030-00010. PMID 17015870. ^ Van Craeyveld E, Jacobs F, Gordts SC, De Geest B (2011). "Gene therapy for familial hypercholesterolemia". Curr Pharm Des. 17 (24): 2575–91. doi:10.2174/138161211797247550. PMID 21774774. ^ Al-Allaf FA, Coutelle C, Waddington SN, David AL, Harbottle R, Themis M (2010). "LDLR-Gene therapy for familial hypercholesterolaemia: problems, progress, and perspectives". Int Arch Med. 3: 36. doi:10.1186/1755-7682-3-36. PMC 3016243. PMID 21144047. ^ Snow V, Aronson M, Hornbake E, Mottur-Pilson C, Weiss K (2004). "Lipid control in the management of type 2 diabetes mellitus: a clinical practice guideline from the American College of Physicians". Ann Intern Med. 140 (8): 644–49. doi:10.7326/0003-4819-140-8-200404200-00012. PMID 15096336. ^ Vijan, S; Hayward, RA; American College Of, Physicians (2004). "Pharmacologic lipid-lowering therapy in type 2 diabetes mellitus: background paper for the American College of Physicians". Ann Intern Med. 140 (8): 650–58. doi:10.7326/0003-4819-140-8-200404200-00013. PMID 15096337.